Dentures supported by implants allow our patients to use dentures to replace their missing teeth while still utilizing the anchoring capacity of a dental implant. Supported dentures can be used in full or in part, depending on the requirements of the individual. With implant supported dentures the dental implants are set in the jaw bone. The implant is made out of biocompatible titanium. The titanium implant fuses with the jaw bone in a process referred to as osseointegration. Supported dentures have two options: bar-retained dentures supported by implants, and ball-retained dentures supported by implants. Bar-Retained Dentures Supported by Implants: These implant supported dentures use three or more implants inserted into the jaw. A metal bar runs along the gums with the denture resting on it. The implant supported is held in place with clips or other attachments. Ball-Retained Dentures Supported by Implants: The dentures supported by implants using a ball and socket design. 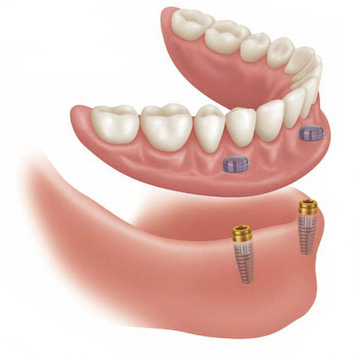 Each implant is equipped with a ball and the denture is fitted with a matching socket. Ball and socket join together to create a secure attachment site for dentures supported by implants. Why Get Implant Supported Dentures? Most traditional concerns relating to dentures can be alleviated by implant supported dentures. Dentures have been known to slip and move during day to day activities like eating and talking. This movement can affect confidence and eating. Certain foods are restricted for those who wear traditional dentures, but not those with implant supported dentures. Dentures also do nothing to prevent the loss of bone that occurs at site of the missing teeth. Denture supported implants prevent this by stimulating bone. Dentures supported by implants could be the right option for restoring your smile. Implant supported dentures can be taken out at night and cleaned. Attachments for denture support should also be cleaned thoroughly. Dr Ryan Taylor will give you complete instructions for the proper care of denture supported implants. Meet our dedicated staff who are committed to ensuring our patients receive the highest level of medical care and support throughout their entire treatment process.